The Atlanta Hawks have elected to keep around their most recent acquisition for at least ten days longer. It looks like Lamar Patterson will not be going the way of Gary Neal. Patterson is not a “one and done” in terms of signing 10-day contracts. 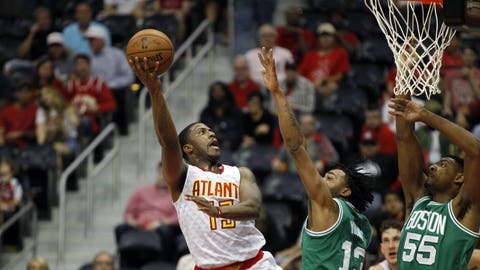 This morning, the Atlanta Hawks announced that Patterson will be signed to a second 10-day contract. ROSTER UPDATE: We have signed @LP21_ to a second 10-day contract. Patterson spent the 2015-16 season with the Hawks before being waived in the summer of 2016. He has spent most of the 2016-17 season with the Reno Bighorns of the D-League. Atlanta signed Patterson to his first 10-day contract on Jan. 29. Patterson has played just two games with the Hawks since his signing, primarily in garbage time. He’s scored a total of six points on 2-for-8 shooting in just 6.7 minutes per game. Last season Patterson averaged 2.4 points, 1.1 assists, and 1.4 rebounds per game on 35 percent shooting. Patterson obviously will not find his way into the rotation unless a serious injury occurs or a trade is made, but it’s still a nice luxury to have a player that knows the system holding the last roster spot. The former Pittsburgh Panther recently spoke to the Pittsburgh Post-Gazette about his NBA experience and coming back to Atlanta. Patterson is clearly a hard worker. It’s nice to see that type of player get rewarded with an extended stay in Atlanta.